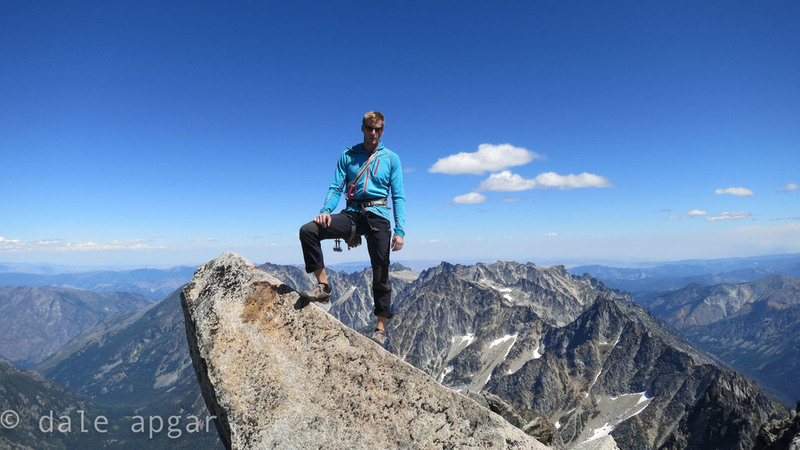 One of goals of 2013 was to explore more – get away from the typical locales for climbing and travel and see new things. Well, it’s not unique to 2013, as such an item should make it on everyone’s agenda annually, but it needed added emphasis this time. 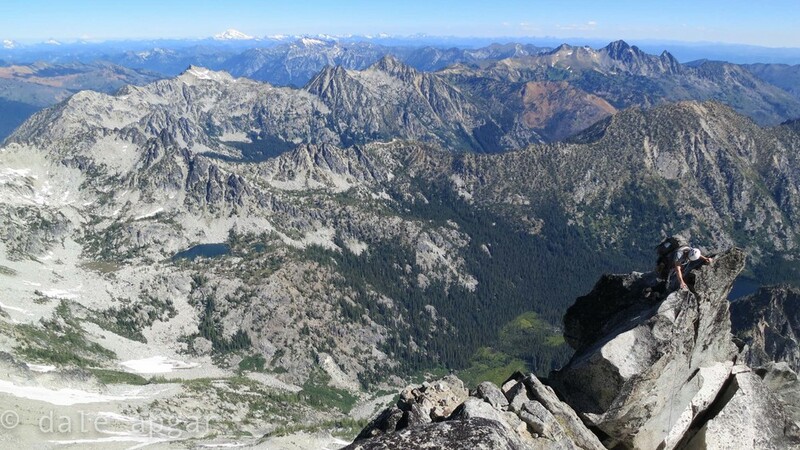 Jeff has been making an annual pilgrimage to the Sierra and I kept saying I wanted to get back to the North Cascades to poke around, so when a weather window materialized, it was bags packed and PNW-bound. Seattle is often overlooked as an outdoorsman’s city because of traffic and it’s reliably shoddy weather. After two straight years experiencing inspiring terrain < 1 hour’s drive from downtown, and seeing that yes, there is some opportunism to be exercised with weather windows, but when they do arrive, they are wonderful and Seattle is a great spot. The plane touched down in Seattle after a long work week, I picked up a rental car, crashed on Jeff’s patio, slept in, and 2.5 hours from downtown, Jeff and I were at the trailhead for a 50 classic – Mt. Stuart’s north ridge. Due to the euphoria of a new place and completely new surroundings, before we knew it, we were finishing off the approach, slipping across a glacier to the base of the true ridge. Note the official 50 classic route cuts off the first part of the technical climbing, but the sit start is a much better choice for parties interested in more technical rock and additional commitment. 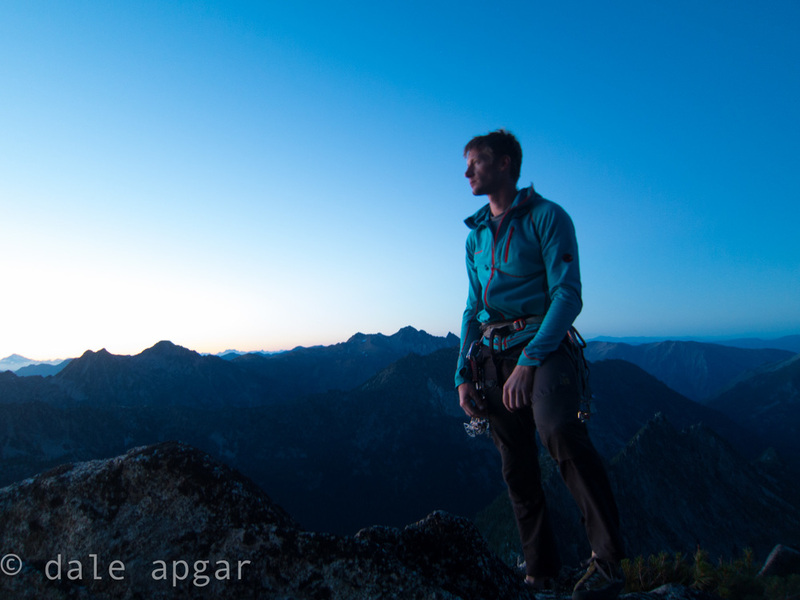 We had debated on doing the approach and bivying at the base of the climb to do the entire route the following day, but with nearly three hours of daylight left, we decided to get as high as we could and bivy on the true ridge night one. 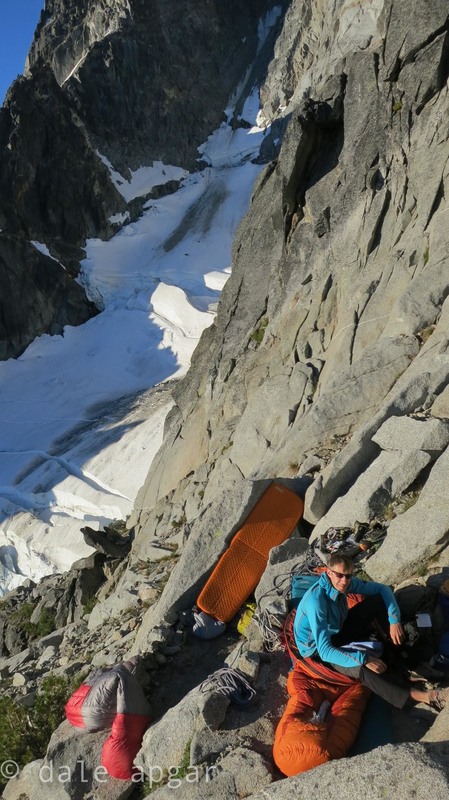 We passed a party of two who packed much less gear and cruised through the technical bits and simul-climbing to reach a perfect, terraced bivy ledge with the last smidge of twilight. Dinner with a view, a nip of scotch and we were sleeping in minutes. Well, I was sleeping…”I think I have a hole in my pad.” Poor Jeffrey had a long night. Day two started with Mozart-accompanied breakfast and some simul climbing. We weren’t in a rush, so the previous party caught us only to be passed again which serves a reminder of good beta: we had no trouble passing this party twice and another group of three higher up on the ridge. There are ample places where the route meanders, splits and rejoins itself, so coupled with the moderate grade route, straightforward route finding, impeccable weather, and a most excellent climbing partner, the theme for the weekend outing quickly became that of nonchalance. Pitch after pitch of moderate moves followed by third or fourth class exposed traversing finally brought us to cruxes. Jeff took the first lieback – liebacking being one his specialties – while I volunteered to take OW bits. With our packs containing all the requisite gear for the overnight, we took an extra bit of caution on the more technical parts, and time to soak in the splendor of our situation: having dispatched the two parties and simulclimbing nearly the entire route, we had plenty of buffer to stop and eat lunch, apply another layer of sunscreen and view the scenery of that section of the cascades. Cruxes passed, we were sipping scotch on the summit by 2pm; We weren’t aiming for any speed records, but enjoyed the freedom of movement on the moderate terrain and surprisingly solid granite. We were even greeted on the pinnacle by hoots and hollers from three paragliders high above – we were not alone in this heavenly place, nor should we be given how gorgeous the place was and how good the weather. A wrong turn on the descent and a nasty case of hubris on my part resulted in a most worthy lesson: Seeing boot ski tracks from a previous party, I swapped Dana Stubblefield for my trekking poles and decided I would do the same: expedite the loss of vertical and shimmy down the snowfield in good style. I quickly found the snow to be much more firm than my predecessors and lost control – along with all my means of self arresting. I was lucky: escaping with only surface wounds to shins, wrist and pride. 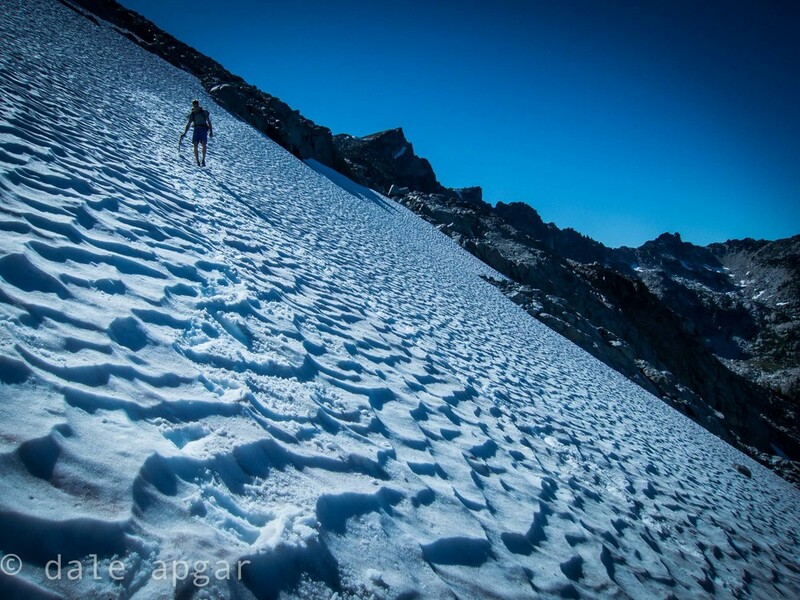 Though I only have a couple small scars upon reflection months later, I will never lose the memory of what I felt sliding directly into a boulder field, nor the sentiment of humbleness at what could have happened. The rest of the descent to the car was much less eventful, and Jeff and I were happily downing burgers in Cle Elum with margin before the restaurant closed. We did run into an ambitious climber in the parking lot prepping for a car-to-car mission of the same route the following day. 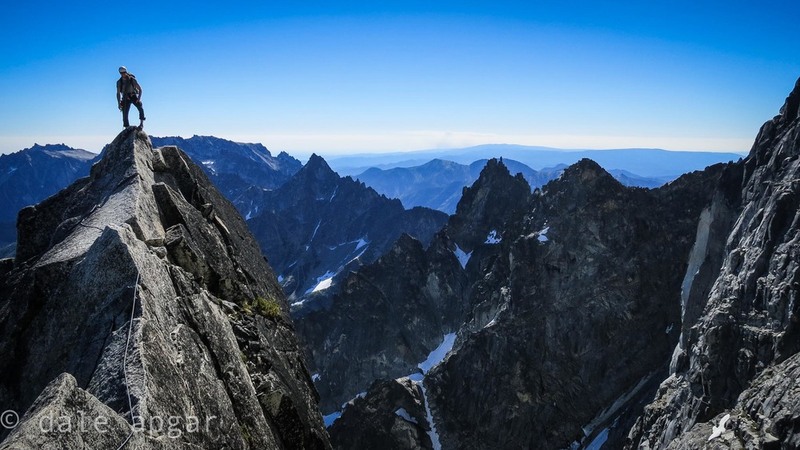 As Jeff and I loaded our packs into the car, the thought of a triumphant light-and-fast mission sans bivy did sound appealing, but we shared delight of spending the night on the side of a Cascade classic. Which goes to serve another reminder: pay close attention to what you want to do. Before departure for the peak, Jeff and I entertained the idea of flashing the peak car-to-car, but the masochism was overruled by the desire to get the full experience on the peak. Looking back, the route is definitely doable in quick fashion due to all the efficient means mentioned above, but we shared no regrets about making a full outing out of it, and leave such a mission for a training effort sometime in the future.